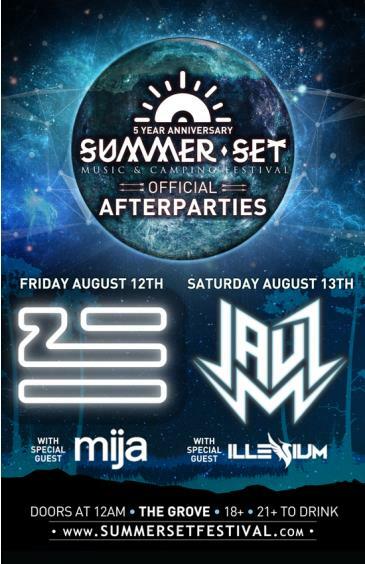 Official Summer Set After Parties. You will need to purchase a 3-Day Camping Wristband to attend. After party tickets are INCLUDED in VIP Camping wristband purchases. AFTER PARTY TICKETS ON SALE NOW! All after party attendees MUST have also purchased Summer Set Music Festival wristband for entry into grounds. All after party tickets are included in the 3-Day VIP package.